In our home I traditionally serve a baked ham on Boxing Day (the day after Christmas). - about 24 whole cloves. Calculate your cooking time. You will need 20 minutes per pound plus another 45 minutes for it to rest. You will also be removing the ham and glazing it for the last half an hour, so take 30 minutes of the initial cooking time. 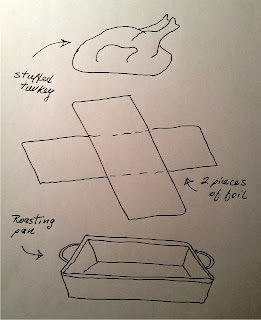 Prepare the roasting pan by placing two sheets of foil into it in a form of a cross as shown in the drawing. 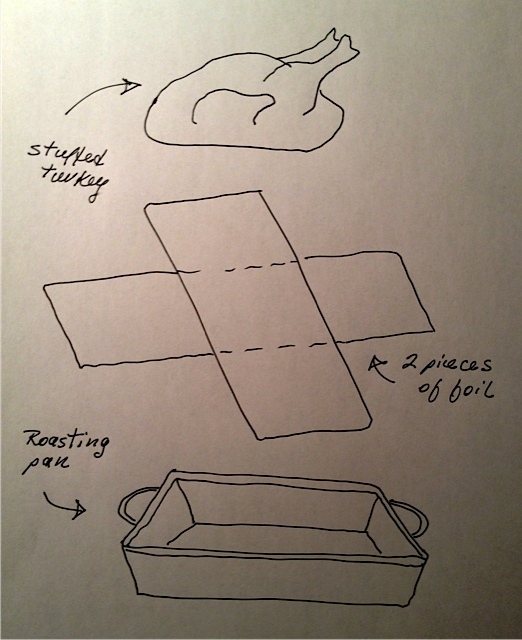 Place the ham into the prepared pan and fold the foil to create a tent. The key is to make sure there is room for air between the ham and the foil, so the less ham that actually touches the foil the better. While the ham is cooking, mix the dry mustard with just enough water to create a paste. Set aside. 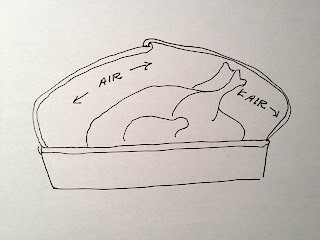 When the ham is ready for glazing, take it out of the oven and turn the oven up to 425'F. 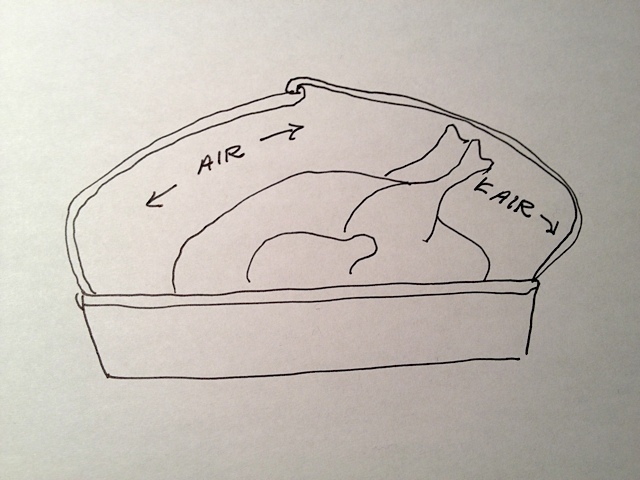 Return the ham to the hot oven and let it cook for another half an hour until the surface has a glazed golden crust. 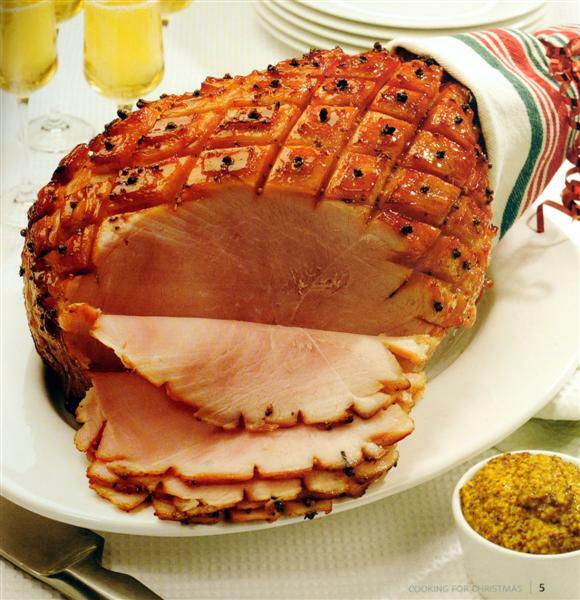 If you are going to serve it hot, allow the ham to rest for 45 minutes after removing it from the oven so the surface juices can seep back into the meat. This will make the meat firm up and it will be easier to carve. If you are eating it cold, just allow it to cool then refrigerate. You can carve it all into slices or just carve when required. If you don't want to fiddle with making English mustard or sticking in cloves, you can just use regular hot Dijon. Press on the coconut sugar and then just sprinkle with a little ground cloves. The flavour will be similar. You can use honey or maple syrup instead of the coconut sugar, but it won't have the same rich flavour. If you have to use one of these, try mixing in a little molasses. 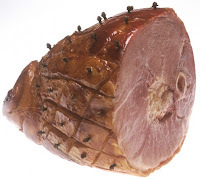 If a whole ham is too big for your family, a smaller ham can be cooked in exactly the same way. Just calculate the cooking time at 30 minutes per lb. Just to give you an idea, a 5 or 6 lb ham will serve 6 to 8 people nicely. One last cautionary note. Check your ham for extra plastic. One year I removed the covering plastic and then roasted the ham not realizing there was yet another layer of plastic below that! When you want a break from all the rich food you have eaten over the Holidays, nothing will hit the spot like some bacon and vegetable soup. If the ham you roasted didn't have a bone, it won't be as flavourful so you might want to add a little chopped ham to the soup as well. Put everything into a large pot except for the cheese and the bacon, season to taste with sea salt and freshly ground pepper, cover and bring to a boil. Immediately turn down the heat to simmer and cook gently for 45 minutes. Stir the Cheddar into the hot soup until the cheese has melted. 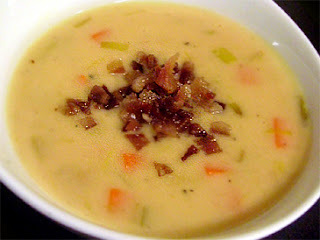 Sprinkle each bowl of soup with a generous amount of the bacon before serving. If you like this recipe you'll find others like it in my Christmas recipe book 10 Easy Christmas Dinner Recipes. There are three books in my Christmas Collection and together they will give you all the recipes you will need to have a great holiday season. At this point you have had a great meal of roast ham, another warming meal of soup, and have lots of leftovers in the fridge for impromptu meals, snacks, and Midnight raiding of the fridge by starving husbands and teens.